Look no further as you have just found a lovely, spacious 2 bedroomed apartment in a brilliant location. Its located on the 4th floor so it's nice and quiet despite its fantastic central location. 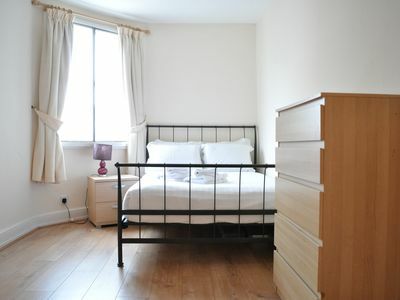 The apartment is across the road from Bayswater Tube station, and next door to a supermarket, as well as having many cafe's, bars & restaurants in easy walking distance while also being a stone's throw away from Hyde park and many of London sights. It is spacious with an open plan kitchen/lounge and 2 double bedrooms, and is fully equipped with everything you need for a short or long stay in London, including WiFi, dishwasher, washer & central heating. The bathroom consists of a shower over the bath, and fresh towels & linens will be provided for you.